In 3D class, we're starting out with highpoly stuff; subdivision modeling, lighting and procedural materials. For our final exam we will have to model, light and texture an oldtimer car. Pretty cool :). 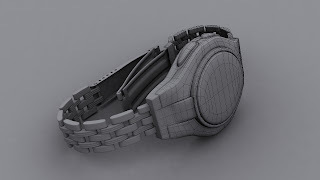 As an introduction, we had to model a small object like a gameboy or in this case, my watch. We needed to pay extra attention to the edge flow, so that everything smooths out nicely.